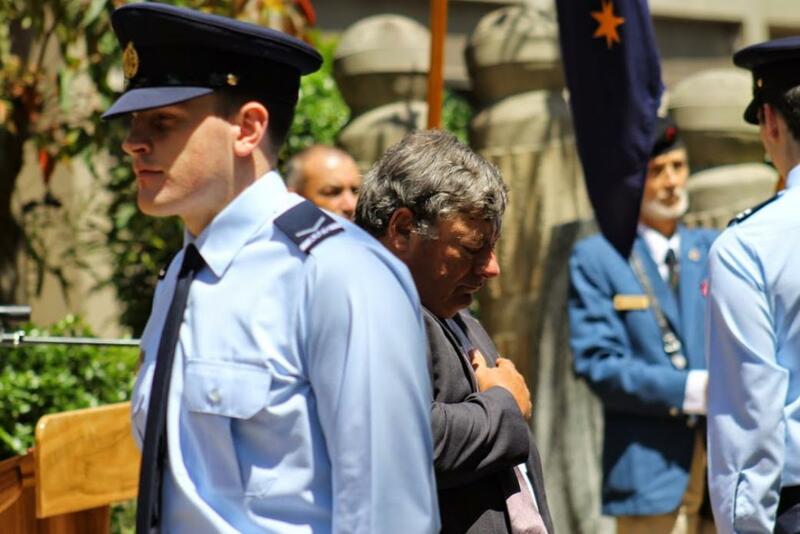 Mark Houlder (Avalon Beach RSL Club) - wreath laying. Remembrance Day is traditionally a time to pause and reflect on all whom have served our nation and all who serve still. Services were held at Pittwater RSL and Avalon Beach RSL this year. We attended the Remembrance Day Service at Avalon Beach, which was conducted by Avalon Beach RSL Sub-Branch President Graham Sloper. Hymns were led by the Avalon Voices, Vice President of Avalon Beach RSL Sub-Branch Bob Lacey read the Prayer for the Fallen and Mr Bruce Crossie, Divisional Chairman Northern Beaches Legacy, read the Prayer for the Services. 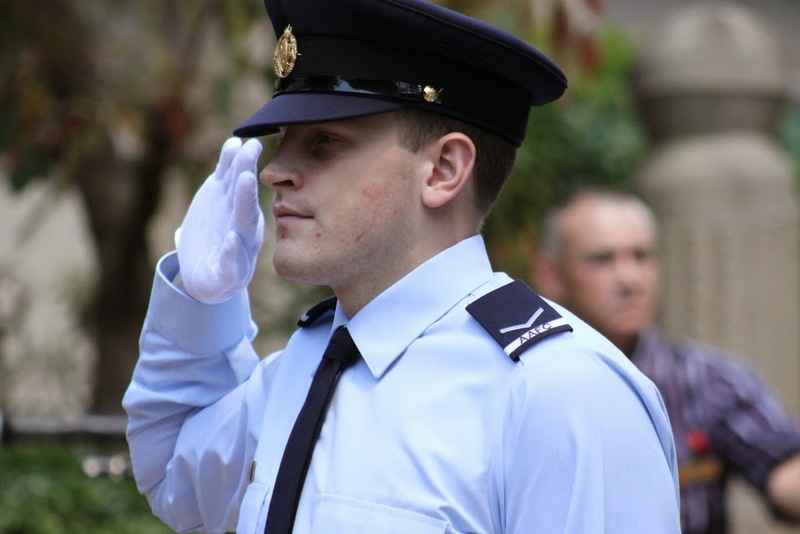 The Catafalque Party was formed from 305 Squadron Australian Air Force Cadets, Michael Graziano, Chad Griffiths, Jack Whaling-Laurens and Jared Willis. Wreaths were offered by Mark Houlder (Avalon Beach RSL Club) Bob Lacey (Vice President of Avalon Beach RSL Sub-Branch) Inspector Jo Comber (NSW Police), Bruce Crossie (Divisional Chairman Northern Beaches Legacy). Many of the two hundred or more people gathered also then placed sprigs of rosemary, poppies and flowers on the Memorial Cenotaph, including attending Pittwater Councillors Jacqueline Townsend, Mayor of Pittwater, Selena Griffith and Bob Grace. Traditionally the Avalon Beach RSL Sub-Branch Remembrance Day Address is given by the Mayor of Pittwater. Many remarked how much they enjoyed the content of this year's speech, which we share with you in full, for the record, and courtesy of our Mayor. I’ll start by paying my respects to the traditional owners of the land upon which we gather. I also pay my respects to the war widows who are here today with us and acknowledge the sacrifices they made. At this 11th hour on the 11th Day of the 11th month each year we come together as Australians to first remember those died in the First World War. At 11 am on 11 November 1918 after four years of continuous warfare, the guns of the Western Front fell silent following the securing of a peace settlement. Since then, today is associated with the remembrance of all those who have died in all subsequent wars, conflicts and operations. The 2 minutes silence was instituted as part of the main commemorative ceremony in London in 1919. The silence was proposed first by an Australian journalist Edward Honey working at the time in Fleet Street. King George V personally requested the people of the British Empire to suspend their normal activities for two minutes on the hour of the armistice, that marked the victory of Right and Freedom. After the Second World War, Armistice Day was changed to Remembrance Day to extend the commemoration to all war dead. In Australia, in 1997, our then Governor-General Sir William Dean issued a proclamation formally declaring today, the 11 November to be Remembrance day and urged all Australians to observe one minutes silence at 11 am each year to remember those who died or suffered for us in all wars and armed conflicts. For some, our act of remembrance can be very personal, as we remember a lost mate or a family member who died or suffered for us. For others, it is to remember and pay their respects to all of those who died or suffered during war, conflicts and operations so we could have our rights and our freedom. For me, it is remembering why we went to war, paying my respects to all of those who died or suffered, acknowledging and extending my condolence to our war widows and children who have suffered the impact of war and to thank all those involved with Legacy for providing support to our defence force families and to Soldier On who focus on helping soldiers who return from war zones with physical and or psychological injuries. The 2014 winner of the Man Booker Prize for Literature is Australian author Richard Flanagan for his novel, The Narrow Road to the Deep North. I mention this today because Flanagan drew deeply from the conversations he had with his late father about his experience as a slave labourer on the Thai-Burma Railway during WWII. He tells the story of the exploration of mateship, writing of the shared suffering that bound those men tightly together in the jungle. It took Flanagan a long time to write this story because he felt he had to be a good enough writer to dare write it. His father was a POW working on the death railway and he held many conversations with him about death, love and compassion he experienced during that time. Flanagan grew up with little talk of his father’s experiences, but his father told many stories in his later years painting a picture of hell endured by the POWs, declaring he was lucky as he only had to suffer, not inflict suffering. Being a POW he said granted those men time to discover themselves and each other along with the great virtues of compassion, love, humility and forgiveness. Flanagan writes, ‘To live is to hope’. With each passing of this day we hear more of the suffering of our returned defence personnel and the impact serving their country has on their family and friends. War has brought homelessness, mental illness, and permanent physical and mental disabilities. As a nation we can no longer ignore this impact and we must speak out calling for our governments to do more for these amazingly brave and committed members of this wonderful Australian Community. I can see no end in sight to the way the governments of the world manage conflict. I see more world conflicts coming where our Defence Forces will be sent. There will be, I believe, more operations and conflicts requiring our assistance and I am saddened by this as I’m sure many of you are as well. But I also see empathy growing amongst us to the commitment and sacrifices made by our defence force that is developing into an awareness of the mental, physical, financial and social impact wars, conflicts and operations have on them, their families and our nation. As a community leader, I ask you to support our returned Defence Force personnel where you can, and extend a warm compassionate hand to them to acknowledge the sacrifices they made for us. Avalon Beach RSL Sub-Branch hosts as their Guests of Honour Legacy widows for luncheon on this day each year, some of whom we spoke to. Many expressed how important Legacy had been in their lives, giving them the opportunity to meet and share experiences with ladies in our area. Doreen Cherry related the young lady she was seated with had been supported throughout High School by this organisation. 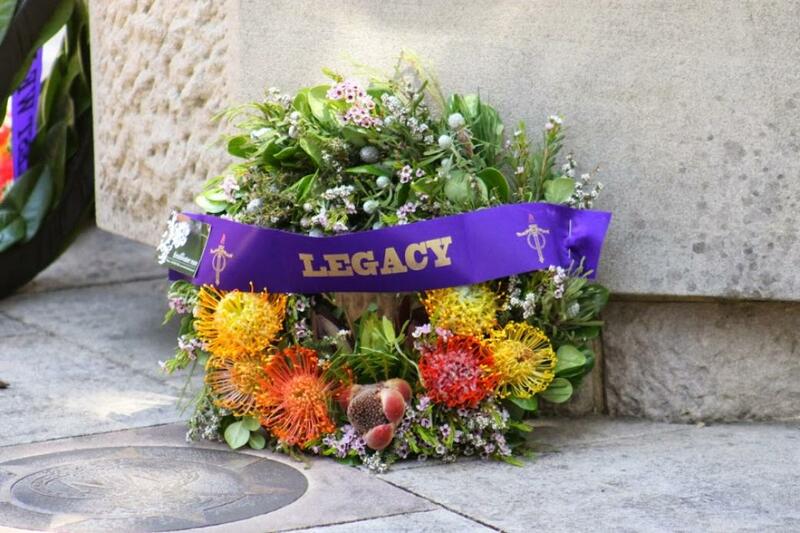 Legacy currently care for around 90,000 widows and 1,900 children and disabled dependants throughout Australia. In Issue 188 our Profile of the Week was the Veterans Centre Sydney Northern Beaches opened in the new Gallipoli Centre at the War Veterans' Village, Narrabeen, to help former and current defence personnel get the financial and emotional support they are entitled to. It is vital we all continue to spread the word regarding VCSNB for Veterans, past and present, and their dependants - contact details on their permanent page. Avalon Beach Sub-Branch would like to thank Avalon Beach RSL Club and its staff for their help and financial contribution to this year's Service.